Ernest Claudius Sackett, son of Edward Curtis Sackett and Mary E Bradley, was born in IllinoisG on 21 January 1877.1 He died aged 88 in East St Louis, St Clair County, IllinoisG, in August 19652 and was buried at St John's Cemetery, Granite City, Madison County, IllinoisG.3 He married first in Jersey County, IllinoisG, on 2 February 1899, Agnes Gilland.4 Agnes was born in IllinoisG in March 1881.5 He married second before 1918, Nancy ___. Charles Weygant, The Sacketts of America, "6732. 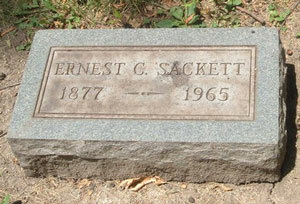 Ernest Claudius Sackett, b. Jan. 21, 1877." 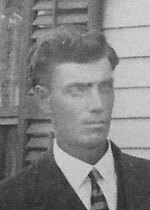 US Social Security Administration, "Social Security Death Index", database, American Ancestors, "Ernest Sackett, b. Jan 21, 1877, d. Aug, 1965, SSN 332-16-2305 issued IL, residence East Saint Louis, Illinois, 62207, county Saint Clair." "Illinois, Marriage Index, 1860–1920", database, Ancestry.com, "2 Feb 1899 at Jersey, IL, Ernest Sackett & Agnes Gilland." James Sackett, son, 1, b. IL, father b. OH, mother b. IL. 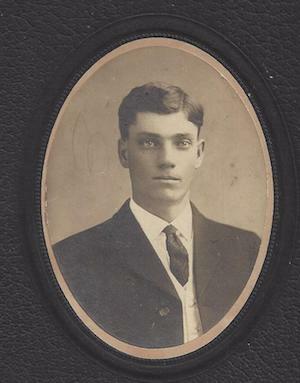 Sackett, Ralph E, son, b. Oct 1899, 7/12, b. IL, father b. IL, mother b. IL. "US, World War I draft registrations records 1917–1918", digital image, FamilySearch, Illinois, Carrollton. Roll A1694. Local Board Greene Co.
"No serial no., Ernest Claudius Sackett, of R.F.D. 2, Carrollton, Ill, age 41, b. 21 Jan 1877, white, native born, Farmer, emp Henry T. Ramsey, R.F.D. 2 Carrollton, Ill, nok: Nancy Sackett, R.F.D #2, Carrollton, Ill. Registrant: tall ht, slender build, no disabilities. Reg 12 Sep 1918."